PIN - SARAH COVENTRY. "CARNIVAL" FROM 1970. 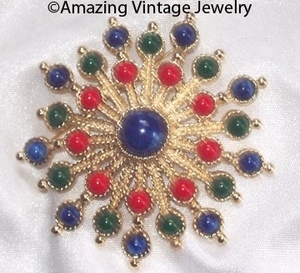 FUN AND EYE-CATCHING, THIS LARGE GOLDTONE STARBURST PROVIDES A CARNIVAL OF COLORS: CENTER BLUE MARBLED CABOCHON SURROUNDED BY SMALLER RED, BLUE, AND GREEN CABS. ABOUT 2 3/8" IN DIAMETER. VERY GOOD CONDITION.